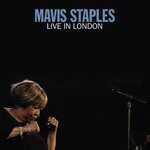 Live in London was recorded over two nights at London's Union Chapel (which she calls "the best place in the world to sing") and produced by Staples herself. Live in London reveals that the singer retains astonishing power after seventy years as a performer and that while her repertoire continues to expand her philosophy is unchanged since her days in the ground-breaking family group, the Staple Singers. Ironically her last live record, 2008's 'Hope at the Hideout', was cut against the background of fellow Chicagoan Barack Obama's historic election, while the new album inevitably addresses the horrors of the Donald Trump era. With the recent passing of her sister Yvonne and her dear friend Aretha Franklin, Mavis Staples is one of our few remaining links to an extraordinary time when the gospel tradition and the fight for social justice were deeply and movingly entwined. The focus of this collection is material she has recorded since signing with ANTI- Records in 2007.